Before the start of a wedding reception I photograph the set-up of the room as well as providing close-up and detail photos of the table settings for my couples. I also set up additional lighting for the many important marital traditions that take place. I feel adding off-camera lighting improves the technical excellence of my photographs. 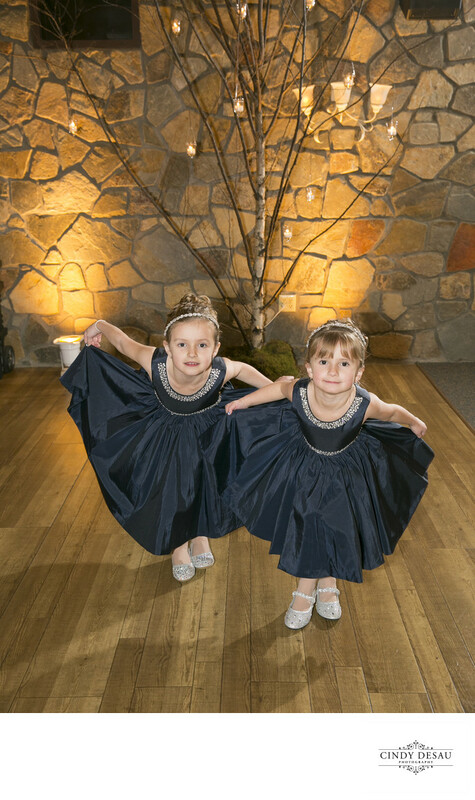 Here I tried out my lighting setup on these two flower girls, who were in the rooms prior to the guests arriving. Looking to give my bride and groom a cute image, I asked them to curtsy, and they did so, in unison. I would say I was successful in creating a cute wedding picture of these flower girl twins.